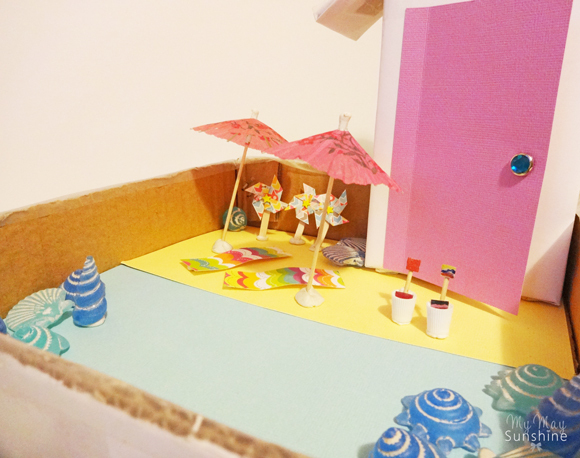 Before half term, Hollie had to make a miniature beach for her homework. To begin with I struggled with ideas for little items to use but once I had looked on Pinterest for inspiration, the ideas came flowing. Here is what we came up with. We started out with a thick square cardboard box which we cut down to make a tray. 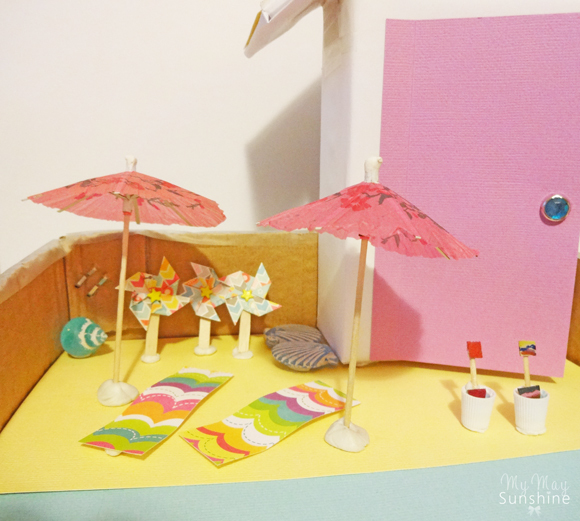 We added some card to the bottom to make the sand and the sea and then got to work making the items for the beach. 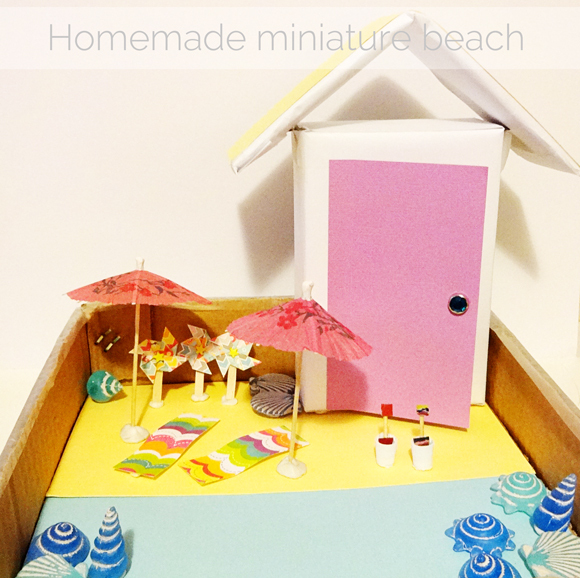 We thought it would be good to make a beach hut but this one is a little too big but it was the best size cardboard box we could find but it doesn’t matter. 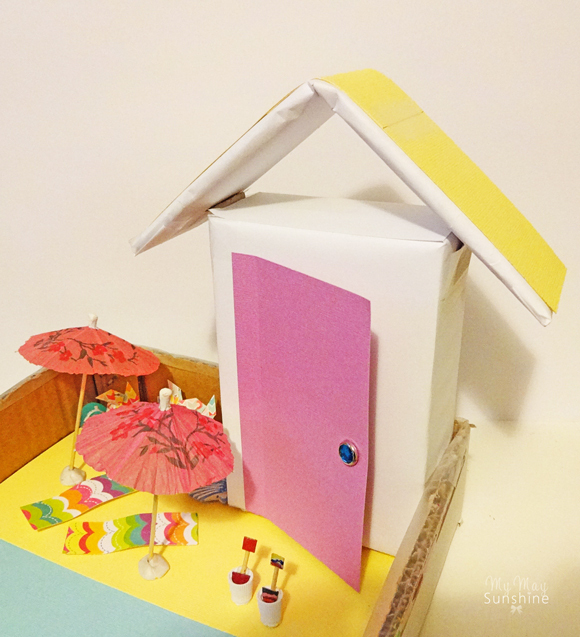 We covered it in basic printer paper and then added a roof and a door. For the items on the beach, we only bought the cocktail umbrellas and the shells. We made some little beach mats, pinwheels and spades and then used two little toothpaste caps for the buckets. We didn’t want to go too mad with it as it was for Hollie, who’s 7, to do (although obviously I helped her) and for her homework but she had great fun gluing, sticking, colouring and tacking everything down. In the end it came together well but I think they send out the homework to test the parents as the homework before was to make the football world cup! What do you think? Do you prefer creative homework or subject based like maths or English? I would love to hear.